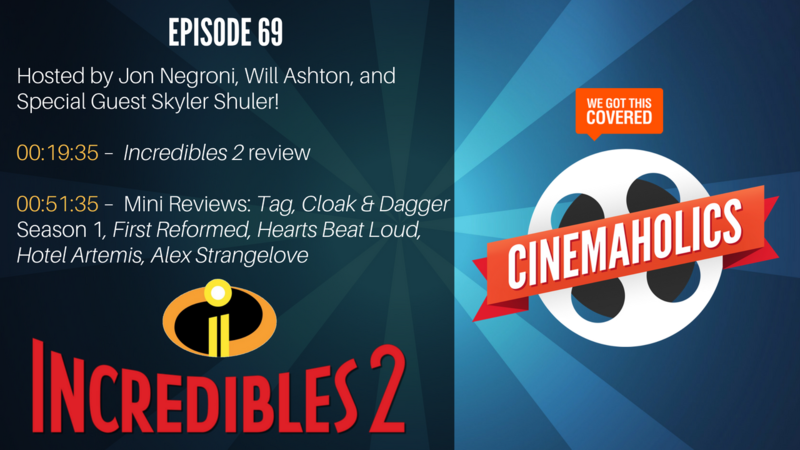 Special guest Skyler Shuler of The DCast joins the show this week to discuss Incredibles 2, the 20th Pixar film and sequel to Brad Bird’s original 2004 animated hit, The Incredibles. Well, Brad Bird is back again, and Incredibles 2 is already breaking box office records. We began the episode with some quick Off-Topics, including news of John Lasseter’s official departure from Pixar and Disney at the end of 2018. If you’re interested in hearing about Bao, the new short film attached to Incredibles 2, you’ll hear our thoughts on that as well. We covered too many mini reviews to list out, but the main ones are probably Tag, Cloak & Dagger, Hearts Beat Loud, and Hotel Artemis. Question for you: Is Incredibles 2 better than the original?